Coconut Foam Pillow, infused with 30% coconut milk fillers, foam core imported from Italy and finished in the USA. This coconut pillow is touted to be one of the most comfortable pillows on the market and works best for people who sleep on their back. The coconut foam feels much like soft latex, the 30% coconut milk gives this pillow a very unique feel and is incomparable to any other foam pillow. OBS has found that most other coconut foam pillows on the market are advertised as memory foam and feel and smell just like traditional memory foam, also many of these so called coconut foam pillows are knockoffs of the original coconut foam made in Italy. OBS has discovered that some large Mattress firms are now selling coconut pillows that are knockoffs of the original “Made In Italy” foam that they are now manufacturing themselves in China under their own brand name. OBS recommends that before purchasing a Coconut Foam Pillow, you confirm that the foam used in the pillow is authentic made in Italy coconut foam and not the china made foam. Now that you know to look for a pillow with authentic made in Italy Coconut foam, look no further, OBS has found it, as described above it’s the “Kon Tiki Coconut Pillow” by Churchill & Smith. The Kon Tiki Coconut pillow is hand crafted in the USA with authentic coconut foam imported from Italy, the foam is infused with 30% coconut milk fillers making the foam naturally anti-microbial. The coconut milk gives this pillow a very unique soft springy latex-like feel. The Kon Tiki Coconut Pillow features a removable zippered outer cover made from a blend of organic cotton and polyester stretch knit material for optimum softness and elasticity. 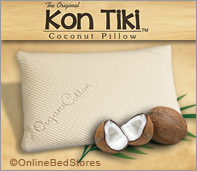 The “Kon Tiki Coconut Pillow is extremely well made from the highest quality materials available and well worth the $219.00 dollar price tag.